Last week, the price of one ounce of gold in Azerbaijan increased by 9.0525 manats or 0.4 percent. Accordingly, the average price of one ounce of gold stood at 2,201.0648 manats. Last week, the price of one ounce of silver increased by 0.5201 manats or 1.9 percent. Accordingly, the average price of one ounce of silver stood at 28.11614 manats. 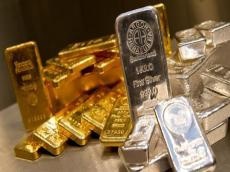 Last week, the price of one ounce of platinum decreased by 5.542 manats or 0.36 percent. Accordingly, the average price of one ounce of platinum stood at 1,532.703 manats. Last week, the price of one ounce of palladium increased by 15.232 manats or 0.9 percent. Accordingly, the average price of one ounce of palladium stood at 1,709.3194 manats.